To continue the delights from New York I have selected 4 very different shows to share with you. These each have an individual story to tell and each one brings that unique vision from the designers to make them a stand out in their own right. 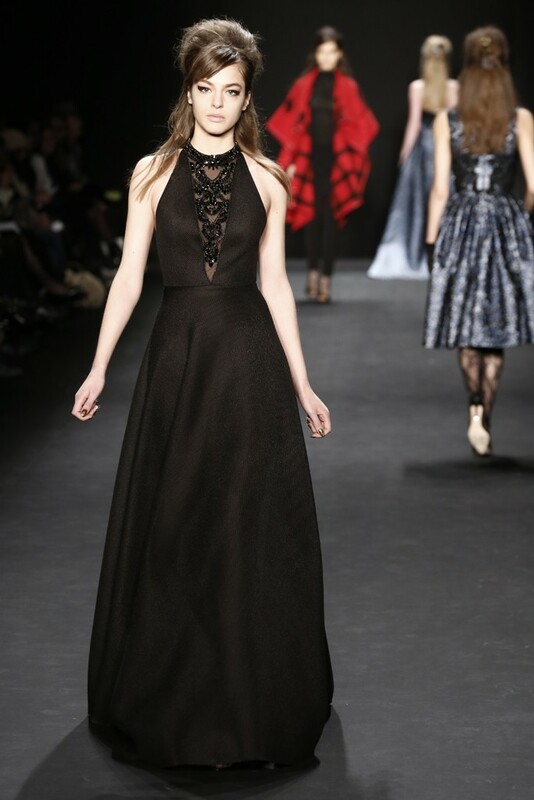 I just love the variety on show this year in New York and the usual, careful thoughts and consideration that goes into each and every show – and each designer or design team needs to do this to stand out from the others on show and to get the editorial inches that they all desire. After all it is all about getting noticed, getting written about and then selling the garments and so putting on a good show (whether the fashion is amazing or not) is a good first step. Then we have to deconstruct the looks and give a verdict about what we have just seen. So here are 4 more designers that made me sit up and take notice! 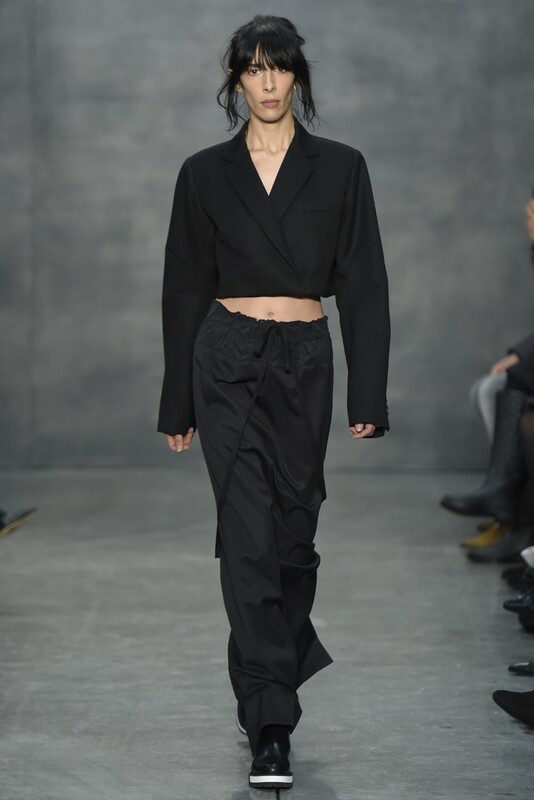 I have for a long time been a fan of Vera Wang and after the rather sombre, depressing shows from last year the designer has returned to her happy place. That does not mean that she has gone back to the white wedding dresses that made her world-famous but rather her own more city smart style. Most of the looks featuring that design favourite this season – black. The looks at the start and the end of the collection, the black crop double-breasted blazer worn with a long drawstring skirt that left the model’s torso exposed and a rich black velvet halter top paired with a matching skirt that featured a matte business suit waistband inserted at the hips, underlined the athletic masculine aesthetic at the core of the collection. 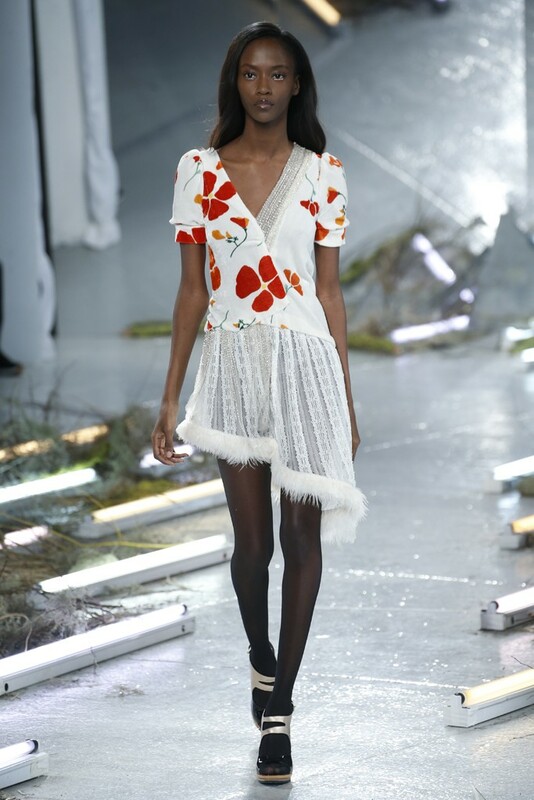 The other change for this collection was the lack of embellishments — other than a smattering of silver sequined flowers — and instead focused on the construction elements of the collection. It was the sleeves of each ensemble, which were the true focal point. There was a range of playful, new looks in terms of sleeves from the sliced out shoulders of coats to the spliced fisherman cable knit sleeves that were put onto a Persian lambskin top. Then there was the inventively added asymmetrical draping at the shoulder or elbow on the sleeves and you know how much I love draping. 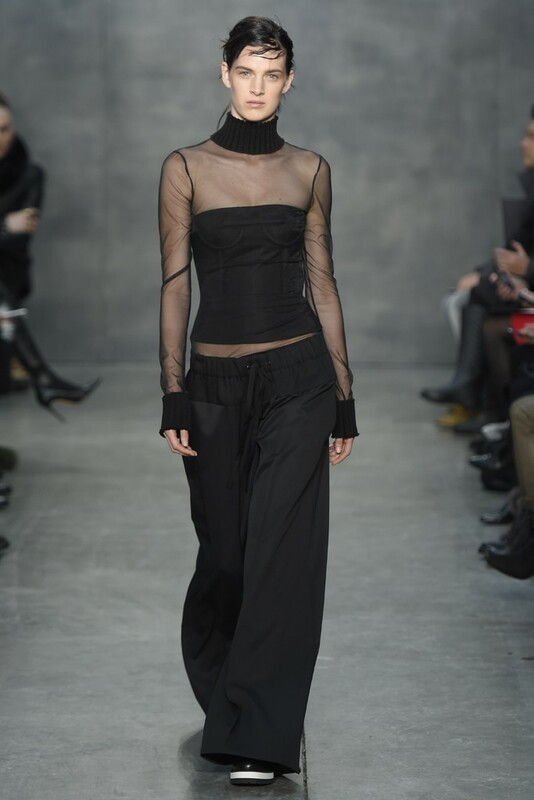 This was a highly marketable collection and even the designer’s more traditional offerings, the maxi knit sweaters, the athletic drawstring jogging pants, and all the long sleeveless column dresses, will easily rush off the shelves. 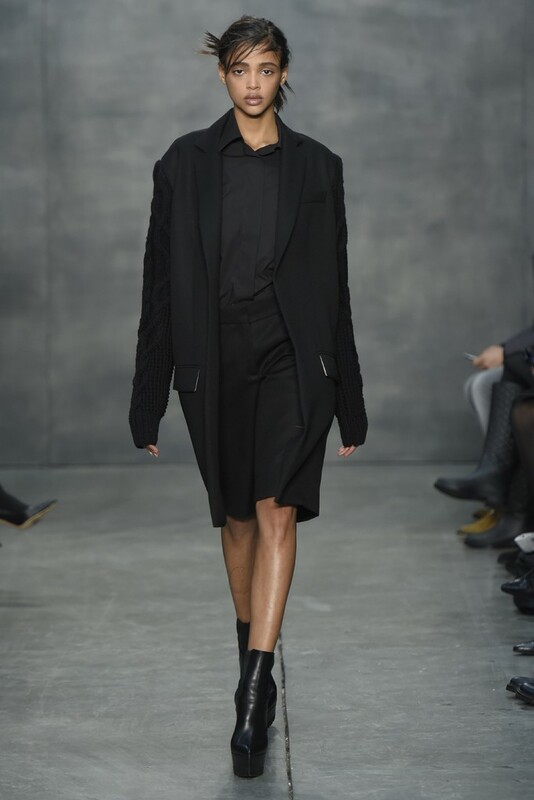 The one look that got the formula just right was an elegant bubble hemmed faille coat that featured buttery leather bonded sleeves, which appeared at the tail end of the show and was pure perfection. 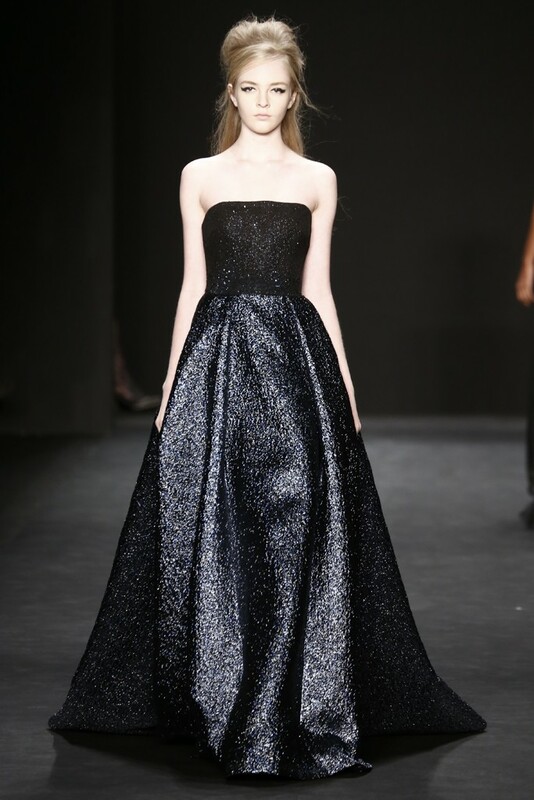 The question that begs to be asked from the Badgley Mischka runway was where were the day looks? With all of the debutante looks there were only a couple of exceptions that could be counted as pre 5 wear. 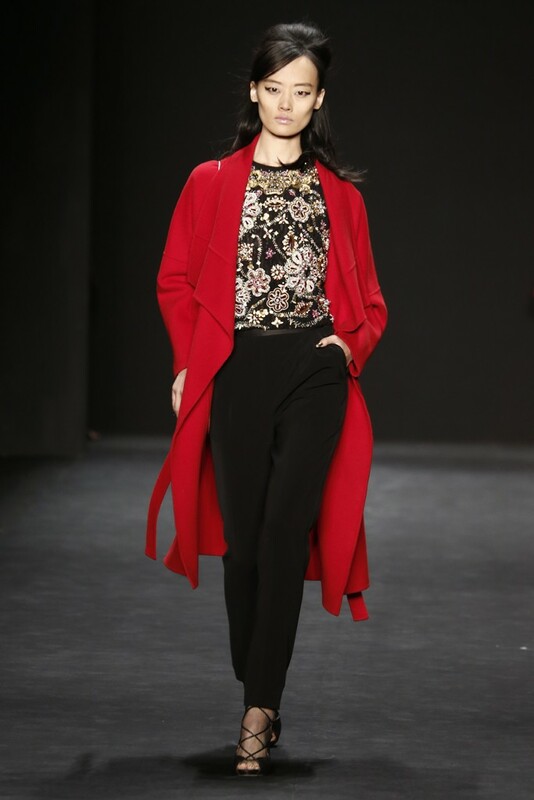 They were two coats — one a standout red oversized poncho — paired with a turtleneck and trousers in black, and you need to ask if this is all that is needed for day wear. And the answer seemed to be yes! 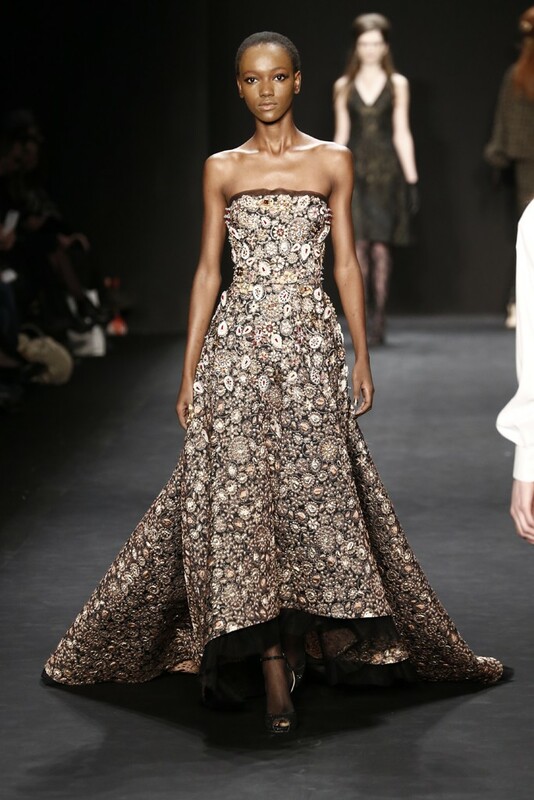 What we saw was a coterie of encrusted dresses, perfect for the social set, that glided down the runway. The silhouette did vary though, taking a trip down the fit and flare route and then there was something a little slinkier. A pair of high-waisted black silk trousers came down encrusted as well as the sheer back panel of a sparkly blur option, that were a real treat. 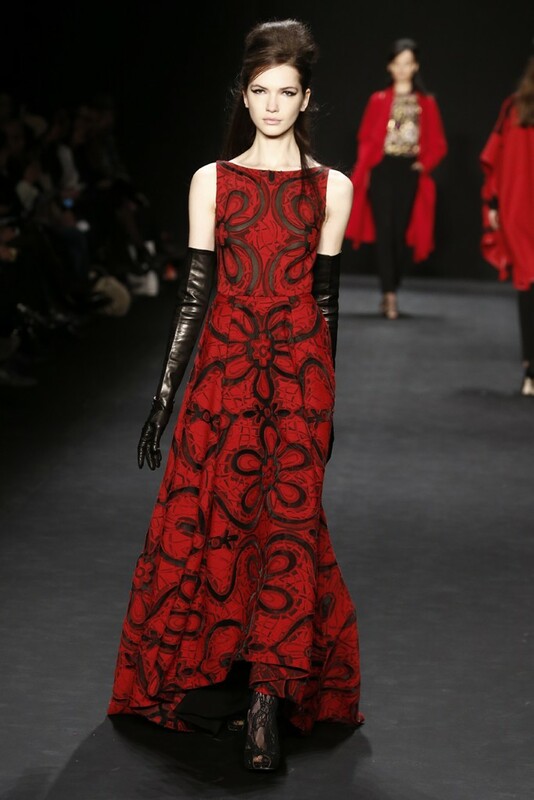 This was a delight with ladylike clutches and a few wrist glove options that completed the creative vision. 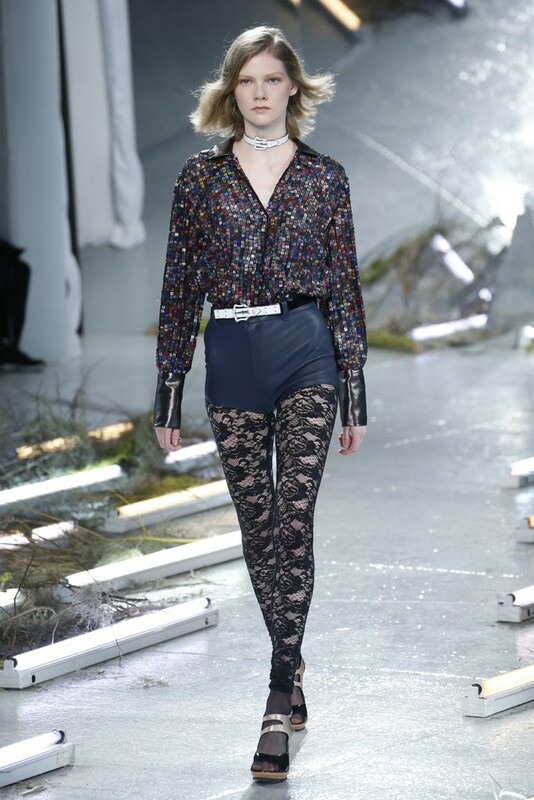 On Tuesday it was all about leather and lace at the Rodarte show. With a smattering dose of sequins and feather embellishments thrown in as sister designers Kate and Laura Mulleavy turned to the beauty of birds and their migration patterns to inspire their romantic creations. Birds have been good to the duo in the past. First it was their California condor collection in 2009 which was a high-water mark in their professional career. Then it was the ballet costumes they made for Natalie Portman’s Oscar-winning turn in the film Black Swan that gave the brand international recognition. 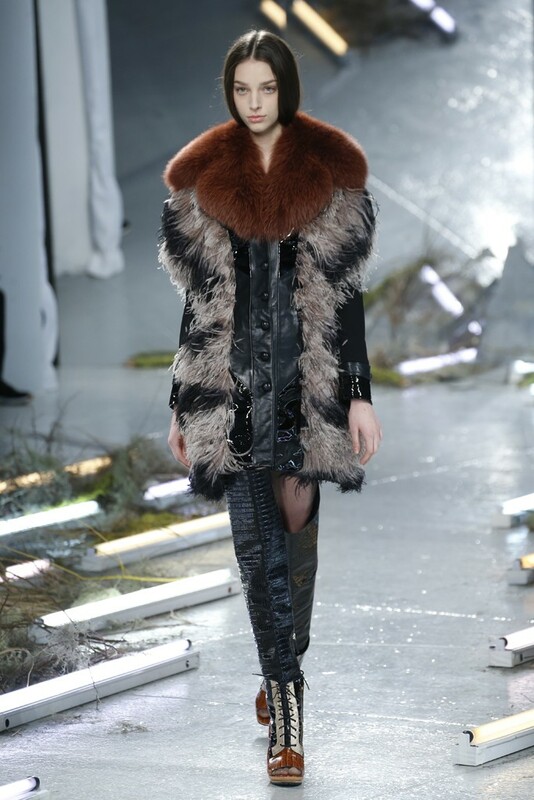 Feathers were referenced in short skirts constructed from strips of leather sliced to finish off in feather like points. There were the allusions to the spindly legs of exotic fowl painted-on high-waisted leather pants with lace inserts running the length of the outer leg. Then the tiered bias cut gowns that were each crafted from slanting diagonal sections built of colourful plumes, embroidered flowers gave those garments a heightened sense of movement and suggested wings in flight. On the catwalk the models appeared like shimmering exotic birds of paradise to close the show. This was a big show that was a shimmering highlight of the designers vision. 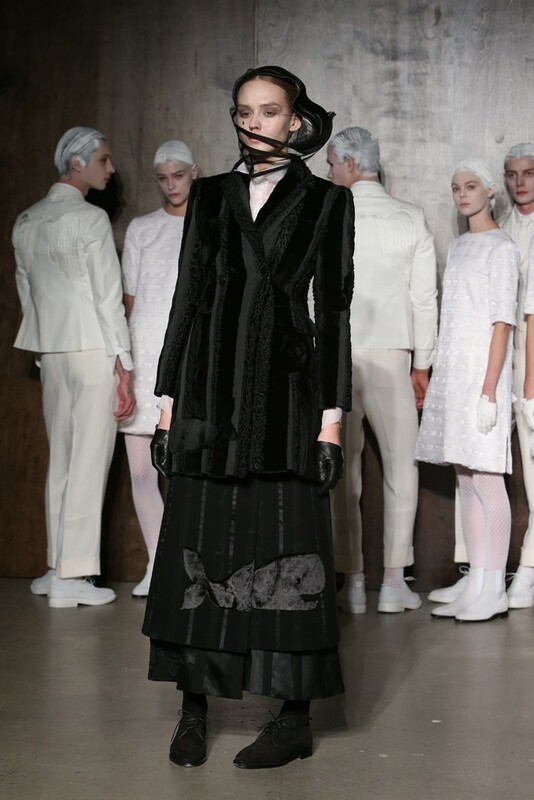 The Thom Browne show managed to intrigue and enthral from the very moment you walked into the space. First there was the scent of recently varnished wood. Down in the depths of the venue the set was finally revealed. In the centre of the space was a mock-up of a turn-of-the-century operating theatre, including amphitheatre seating for the guests to watch the collection unfold. As a precursor to the show the audience was treated to a pre-show performance that consisted of pairs of men in white from head to toe peering down on equally pale female models who lay on metal gurneys. If you were lucky enough to be close you could see the outline of wings underneath the tailored jackets worn by the men and notice the delicate dresses worn by the women featured rows of turtles and whales woven into the lace. 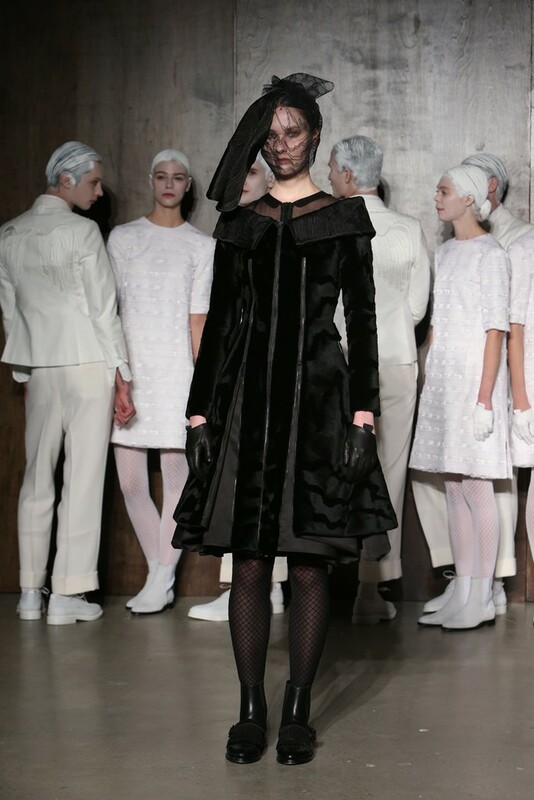 When the angel of death appeared to start the show, she was actually the bringer of life for the collection. Even though it was filled with black widows who looked to be the partners to Browne’s mourning men from his menswear show last month, each ensemble could actually thrive in a real life situation. 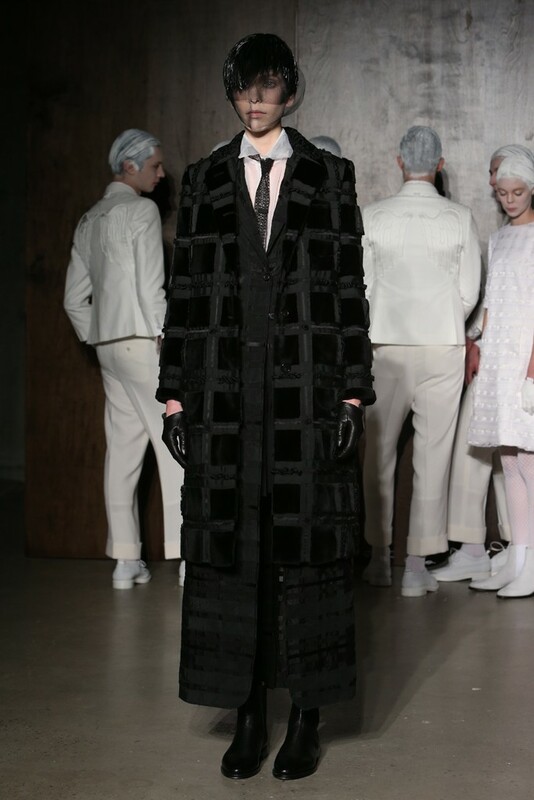 An issue that Browne has struggled with up until now with his womenswear line and its high theatricality. 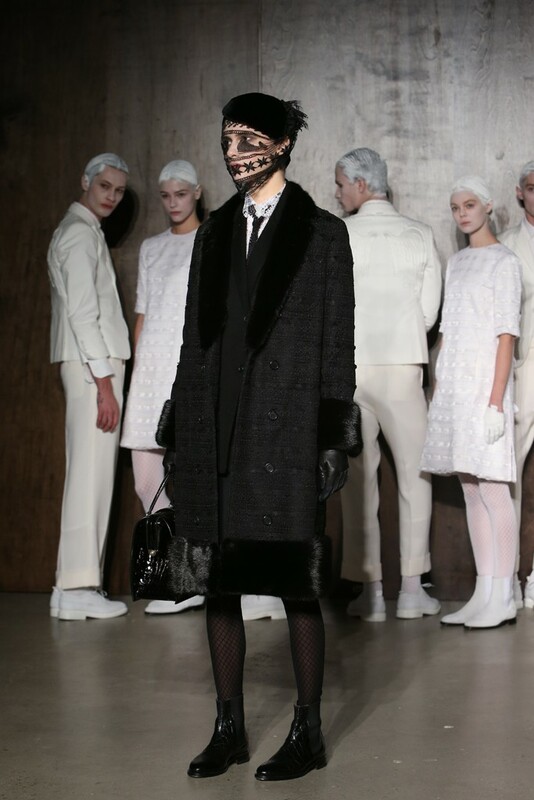 Each and every dress, pantsuit and overcoat in this show was meticulously tailored and executed. 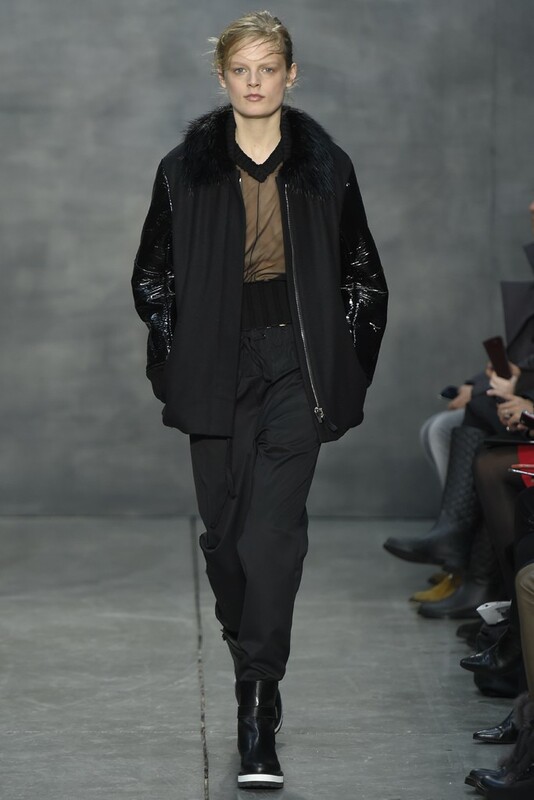 The quirky trompe l’oeil string of glossy black pearls ringing the neck of a matte black coat was simply divine, as was a glossy coat crafted from a silk and nylon grid-like jacquard. The complexity and originality of this entire collection were a tour de force that has not been matched at other shows this week. A mention must also be made of the stunning hats from Stephen Jones. With the breadth and width of their uniqueness they were still able to create a cohesive bond with the ensembles they were matched with. The arrival of each new look onto the runway brought with it the belief that Jones would be unable to top the previous one but then he did. This was a sensational parade that was masterful, controlled and a true delight.